BRISTOL - Bristol Girls Softball Senior League ace pitcher Kayla Wisz is no stranger to Plainville athletics. Wisz, a Plainville resident and standout high school player as a freshman this past season for the Blue Devils, helped lead Bristol against her hometown in the District 5 championship series. Bristol won the best-of-3 series over Plainville with a 14-4 victory on Friday evening as Wisz got four strikeouts, giving up four hits and four runs after keeping Plainville hitless through the first three innings. “It was one of those instances where she had been on the team previously and got cleared to play for Bristol by Little League,” Bristol Little League Softball President Adam Whitlock said. In the first game she had a no-hitter and struck out five of the 14 Plainville batters that faced her. Wisz is equally important at the plate for Bristol. Hitting in the No. 3 spot of the order, she walked and had an RBI single in the first game of the series. Wisz’s fastball overpowered the Plainville group. As District 5 champions, Bristol advances to the state championships that begin at Orange’s Old Tavern Complex next Friday. There will be four teams competing in that double-elimination tournament. Plainville might be left wondering “what if?” as Bristol continues its run. 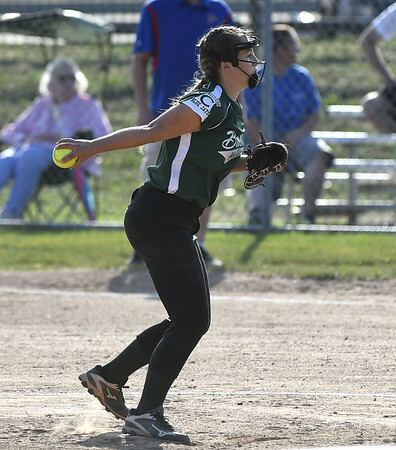 Little League roster decisions began to take shape as high school seasons ended and players began to fill out Senior League Softball rosters. The CIAC does not allow players to be participating on two teams at the same time. With 15 players on its regular season Senior League Softball roster, Plainville did not take Wisz with just two games remaining in fairness to the girls who had been playing on the team all season. “Because of where the season was at the time the high school year finished, we didn’t want to set that as a precedent in our league, even though she would have been helpful for the team,” Plainville Little League Player Agent Jennifer Michalek said. Bristol only had 10 players at the time on its team, which made it reasonable to add Wisz regardless of her talent level. Wisz played for Bristol in previous years, as Plainville didn’t field any Senior League Softball team in those years. “If we had known that fielding an All-Star team was a possibility we might have done it differently, but at that time we were unsure if we would even have an All-Star team for Plainville,” Michalek said. Posted in New Britain Herald, Plainville on Sunday, 8 July 2018 14:20. Updated: Sunday, 8 July 2018 14:22.